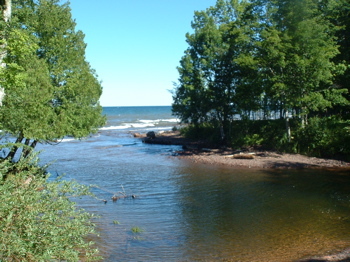 The mouth of the Big Carp River flowing into Lake Superior in the back country in Porcupine Mountains State Park in Michigan. Most of us do not enjoy conflict. We usually seek peace and symbiosis in our relationships with others, our jobs and the many things we juggle in our lives. Sometimes though, conflicts arise, and we are faced with a choice to face the conflict or avoid it. At times, we may compromise our values in order to avoid a conflict. In some cases, it is worth giving up something of a lower priority or value to maintain peace. In other cases, allowing others to repeatedly compromise our values leads to resentment and distracts us from inspiration. Living an inspired life, practicing kindness and the Golden Rule does not mean letting others walk all over us. In fact, we are doing a disservice to others when we fail to set boundaries with them. Just about anyone who has ever had a roommate has had the opportunity to challenge their boundary setting skills. In my early adulthood years, I had quite a few roommates, and the outcome of nearly every living arrangement was nearly identical: mutual resentment, a damaged friendship and tension that escalated to the point where we were forced to end the arrangement. My ability to set boundaries and discuss things that concerned me was inadequate. It has grown substantially over the years, and what is clear to me today is that the ability to effectively set and maintain boundaries is directly related to one thing: self-worth. If we do not feel that we are worthwhile, the whims of others, no matter how insignificant or unreasonable, take precedent over our needs and desires. When we learn and internalize our true significance as God’s creation, the demands and requests that come to us from others are more easily filtered by the questions, “Is this worth my time, effort and sacrifice?” and “Does this resonate with my true purpose?” These simple questions can help deal with difficult boundary setting decisions. To continue reading about this topic, see Know When to Say “No”. LIfe is a conflict and it is something you cant get away from.